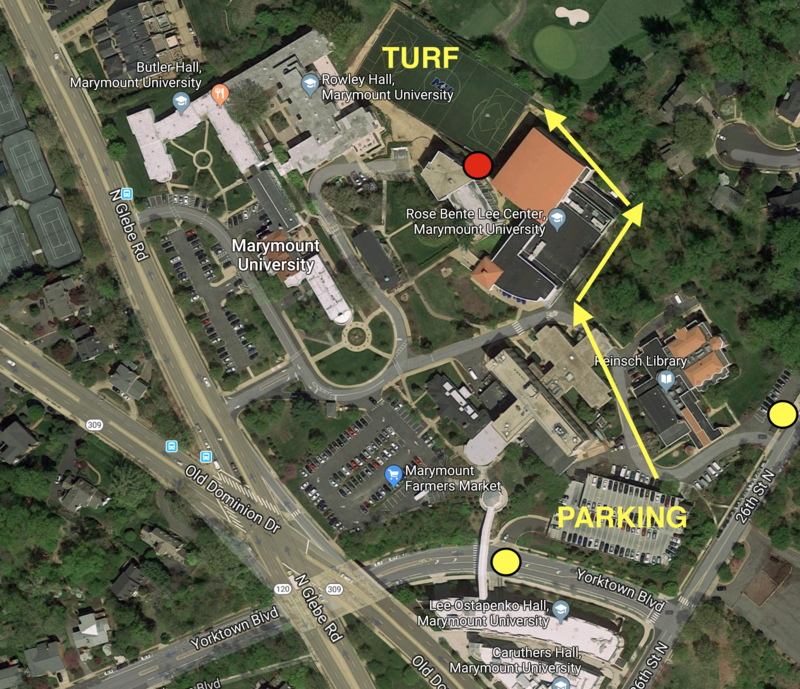 Arlington Lacrosse has partnered with Marymount University to ensure we have enough turf field space for our players. The University is at the intersection of Glebe Road and Old Dominion. As part of our arrangement with Marymount, AYLC gets to use their new turf field for our practices. The turf is behind their Field House where they have their basketball gym and swimming pool. Please park or drop-off at their parking garage (see map below), which you can access from either Yorktown Blvd or 26th Street. From the garage area it is about a five minute walk around to the turf so please plan to be there early enough so you can make it to the field prior to practices starting. Marymount does not want AYLC parents or coaches to park in their upper surace lot so please use the parking garage. There is a large wall on one side of the turf that is ideal for Wall Ball which is great to do before practice.